Early Thursday, May 30. Robert Clark and I strike out on day two of our western South Carolina explorations. As I drive into Carolina we’re both quiet, thinking. “Her sun went down while it was yet day,” Jeremiah 15:9. I couldn’t get that epitaph out of my mind. 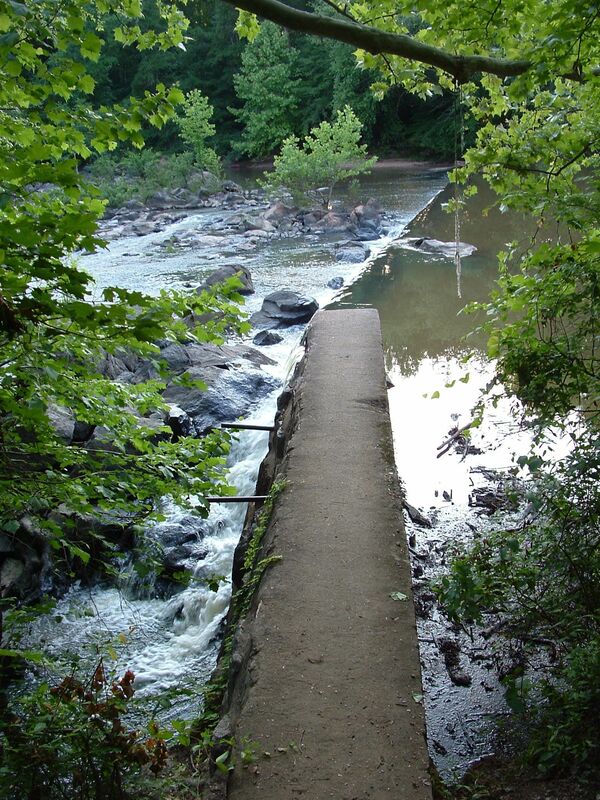 Nor could I forget the photos a woman showed me on a bluff overlooking the Calhoun Mill damn the evening before. Wearing a two-piece yellow swimsuit laying bare the requisite tattoos she walked over, more than a trace of beer on her breath. She put her iPhone in my face. There it was. A photo of the canopy and among the branches floated a headshot, the unmistakable image of a young man with a goatee. He was wearing sunshades and a jaunty cap. Spirits, a song, Brenda Lee a local girl, and the dead accompany me as I drive through backwoods afire with morning light. Robert and I photographed Badwell Cemetery. Then we backtracked to the nearby springhouse. The records say a plantation stood here. James Louis Petigru, Secession opposition leader, lived here. The plantation home burned in the 1920s. One structure remains, the springhouse. Made of stone blocks it squats over a spring. Above the door the year 1851 is chiseled into stone. People placed their food in vessels and kept it cool in the springhouse. Well, cooler. It’s worth a visit, this precursor to ice blocks in sawdust and refrigeration. They say growing old is not for sissies but age opens your eyes. I had traveled these same roads as a young man and all I remember is piney woods isolation. Driving down a graveled road through desolate areas back then seemed a desperate way to get, well, somewhere. The roads look the same, but I see them better now. The eyes of the boy and eyes of the man see things differently. Historical markers now hold more interest than beer signs. And here’s a marker straight ahead, John De La Howe School. The John De La Howe School was founded in 1797 to provide destitute and orphaned children an education. The school is a surprising complex of buildings, among the more beautiful of which is an old barn. Built in 1931 for dairy cows today it’s a country marketplace and concert hall. We came to photograph a tomb. In the 1980s Robert had photographed De La Howe’s tomb for South Carolina Wildlife magazine. “Have you seen the tomb,” he asked. I hadn’t. We took Tomb Road, a lengthy road dead-ending at De La Howe’s grave. That’s where disappointment waited. The tomb’s roof was gone and orange strings crisscrossed the small cemetery. It looked as if an archaeological dig would soon commence. Not sure De La Howe, a physician, would be pleased. His will left specific instructions about his burial arrangements. His grave was to be unmarked and surrounded by a wall 10-feet square, 8-feet high, and two bricks thick. It was to have a steel door and lock and the site kept in good order. Where the roof should have been a tall green stalk sought the sun. Perhaps the grid of strings hints of preparation for plot improvements and a new roof. Perhaps the old doctor will be happy once again. We had started early and already the day was getting away from us. Lunchtime. We headed back to Georgia to lunch with Mom, after which we would strike a path toward Edgefield. “Around these parts” as they say, you have the road to yourself. Well almost. Log trucks thunder down these roads. Big trucks laden with big logs. When a log truck rumbles by you think of how these woods must have looked before the saws came. When log trucks rumble by oaks along the roadside shiver. Making our way onto State Road S-33-135 smoke stained the horizon a dirty yellow. Seems smoke would bedevil us the whole trip. The Sumter National Forest’s Long Cane Ranger District sprawls along the Georgia border and it was time to burn away the understory. Soon we passed men with two-way radios on ATVs. Tongues of fire licked the pines and smoke boiled into the sky. It would not be our last encounter with fire. Death of a mill operator. I heard a tractor overturned and killed John Price bringing an end to the old mill’s run. 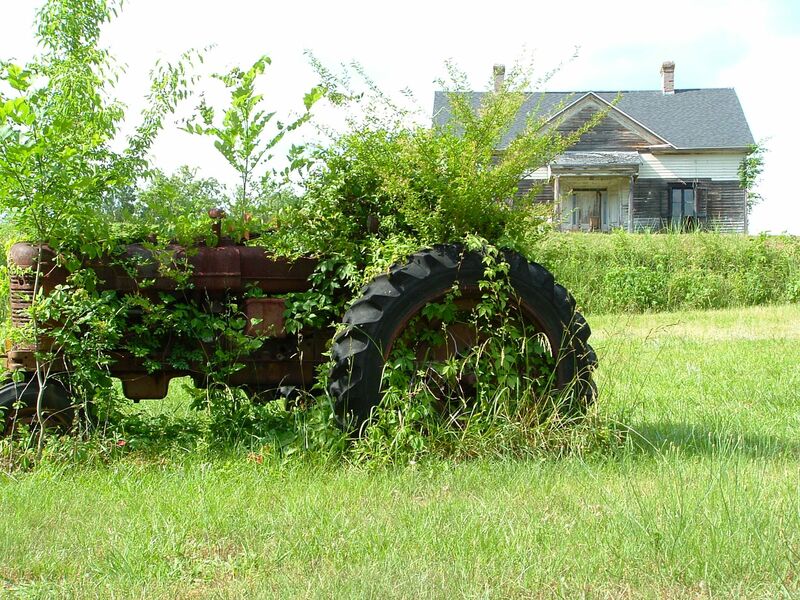 That tractor in vines? Was it the one? Did they just leave it right there? We re-crossed the bridge, pulling into the opposite lane and stopping for a better view. Downstream in a sweeping curve the creek breaks right and rocks create riffles and there just barely we could see clumps of white flowers … surely it couldn’t be. Surely it was. Rocky shoals spider lilies, a rare and beautiful flower. We crossed the bridge toward Plum Branch and parked. We got out and saw a No Trespassing sign. No other way in existed unless we wanted to wade through water hip deep or tightrope across a large rusty pipe, which looked as if it would collapse. The lilies were nigh impossible to get to. A call or two later we were told that if we wanted to photograph the lilies up close we’d have to risk a descent down a steep, high bluff across the creek, more like a river really. We headed back across the bridge where we pulled into a side road barricaded by a gate. We got out, unloaded the cameras, tripods, and accessories and trekked up hill for several hundred yards. Then through an opening far below, there they were, resplendent in late afternoon sun. The bluff, as steep as any I’d seen, dared us to descend through its tangled vines and brush. Trees burst out of the ground at an angle. So it seemed thanks to the abrupt way the land fell off. Right away we both fell. Robert’s camera bag tumbled downhill until a helpful tree snagged it. I caught myself on a sapling and swung around, my camera banging against me. We made it to the bottom where recent floods had muddied things and rocks were coated in slime. Dangerous footing. Photography commenced. The flowers preened like stars. Gleaming white with dark green foliage, they gently swayed with the creek and wind, bowing with grace like leading ladies. All was good, though now and then I heard noises on the bluff above. Something crashed through the underbrush up there … wild hogs? Muffled explosions joined the ruckus above as we moved to get a better angle. The noises bothered me. Wild hogs aren’t in the habit of exploding things. 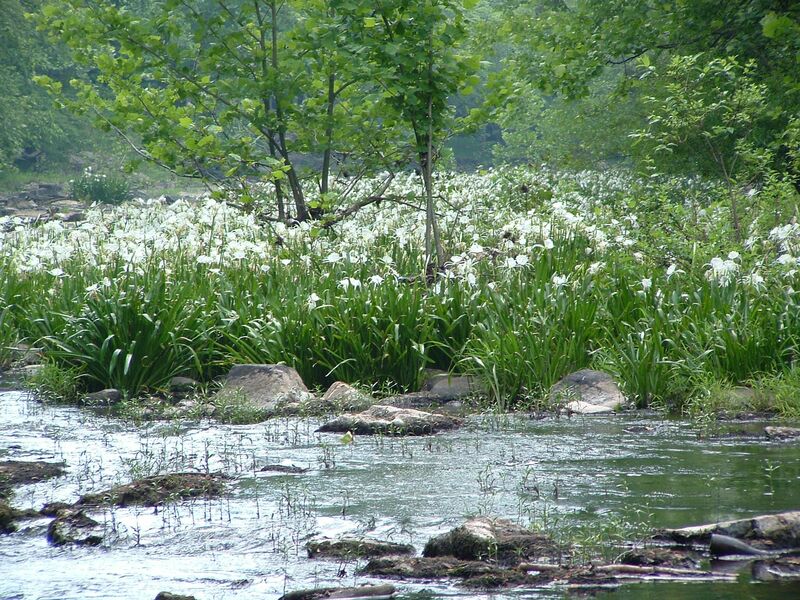 We moved farther downstream to get closer to a profusion of lilies. Spider lilies. That name comes from six long, slender petals beneath the main bloom. Altogether it gives them a leggy spidery look. Rocky shoals, well that’s the disappearing habitat where they flourish. Rocky shoals spider lilies. Makes sense. Things were going pretty good but climbing the bluff to our back preoccupied me. We had heavy gear to carry up. Worries over a fall and broken leg or snakebite are never out of my thoughts when we’re afield. Having cell phones provides a degree of comfort but it shouldn’t coax you into carelessness. I was taking a few shots of Robert in action when fog rolled across the water downstream. A Deep Purple moment though conditions weren’t right for fog. And then the woods on the bluff behind us crackled and popped. Looking straight up I saw orange and yellow flames leaping through pine tops. Smoke on the water! The telltale smell of woodsmoke arrived. I looked back up at the bluff. I didn’t see any flames but what worried me was smoke inhalation. Sure we could wade into the creek but the smoke downstream hugged the water. Why wouldn’t it do that where we stood. We never saw fire as we made our way up the bluff, going out of our way up a gulch and taking a longer path back that wasn’t as steep. Other than encountering what appeared to be a downed power line, dead, we had no problem. Back at the car Robert made a pronouncement. We headed to Edgefield where Robert photographed the artsy fiberglass turkeys that adorn corners, streets, and porches. Then we hit Highway 23 and called it a day. So we thought. 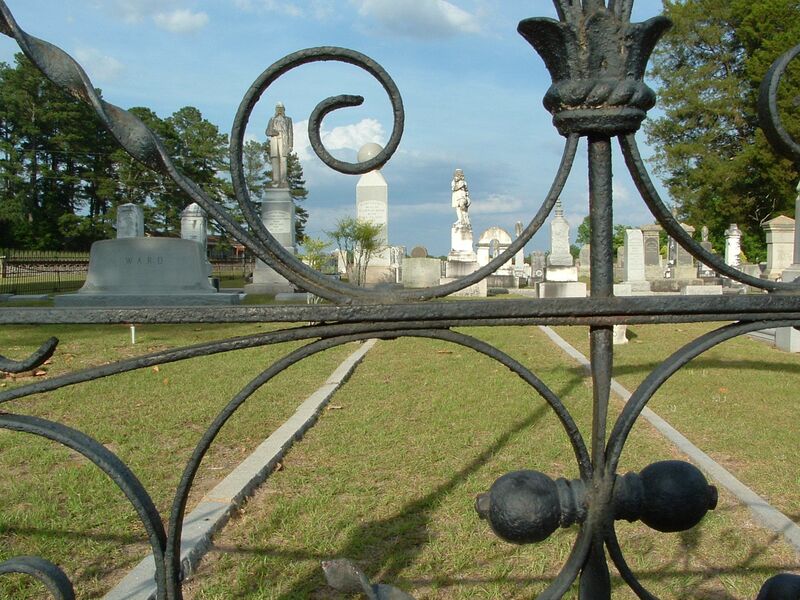 Driving through the hamlet of Ward we spotted an exceptional cemetery beside Spann Methodist Church. The church had its start around 1805 as part of the plantation of John Spann Jr. The cemetery that caught our eye came to be in 1840. More than a few Confederate soldiers sleep here as do the founder of Ward, Clinton Ward, his wife Martha, and their only child, Josephine. Little girl Josephine stands atop her monument, a haunting statue. She died at six. Her sun went down while it was yet dawn. The statue of Clinton, with his period-vogue lamb chops and beard, stands atop a tall monument but Martha merely has a large sphere atop hers. Unusual too is the cast iron statue of a deer at the cemetery gate. The statue of a dog by a tree stands near the railroad track. 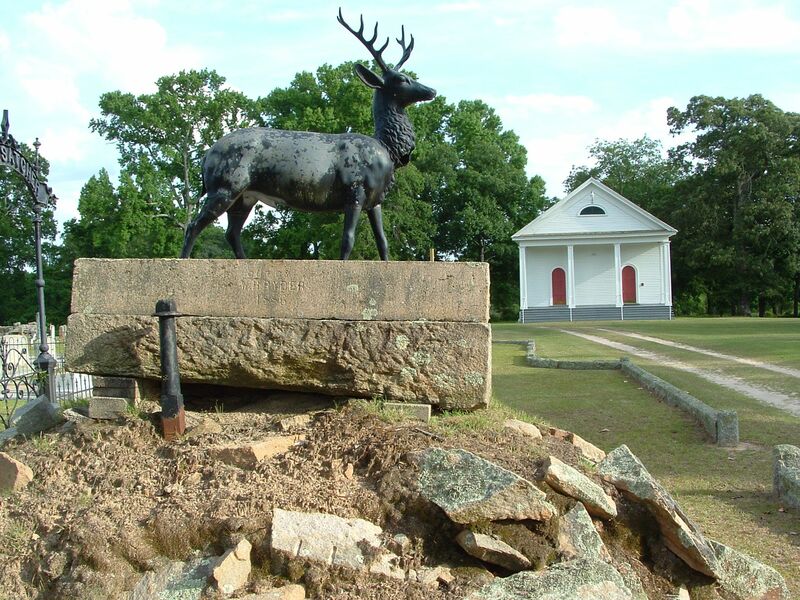 Ward’s marker, his wife’s, the deer, and the dog made the Smithsonian’s Inventory of American Sculpture. The church and its cemetery made the National Register of Historic Places. Not your ordinary graveyard. Something about cemeteries soothes me. Nobody there worries about anything, and I feel compelled to walk among the stones reading inscriptions. As the sun sank, as Robert took photos, I took a few too for use in this column. I stood behind Clinton Ward’s statue, which makes it seem he is staring at a distant water tank. And why wouldn’t he. On that tank is one word, “Ward.” To the left of Ward’s grave is his wife Martha’s. How interesting it’d be I thought to get a shot of Ward looking at the water tank. I took the shot and it runs with this column. You can see that light struck the lens creating what photographers refer to as a flare. I got a bit of a jolt when I saw orbs floating around Ward’s statue. 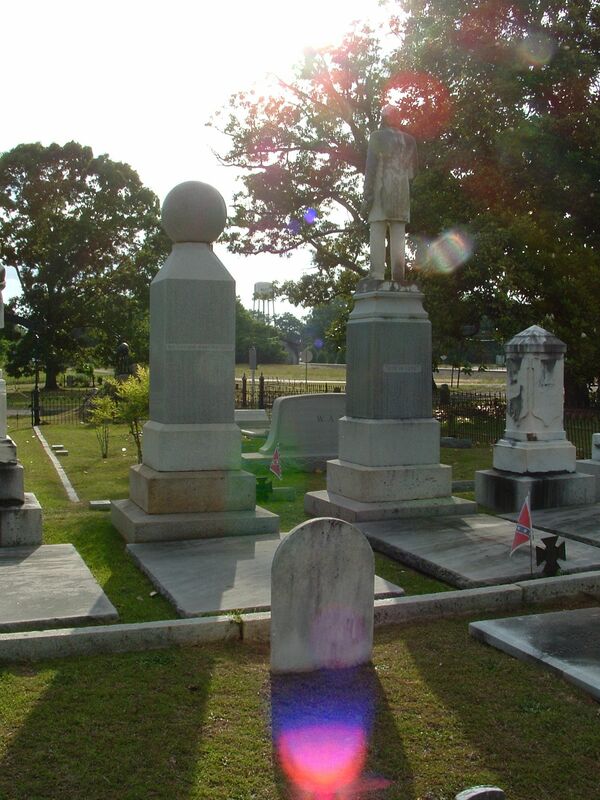 Believers of things paranormal refer to them as ghost orbs. Maybe so. Maybe I should claim to have photographed spirits. Maybe I won’t. The biggest surprise was not the orbs. It was the ghostly aura coming off the small marker behind Martha’s grave. Maybe, just maybe, I thought, the troll that haunts Badwell Cemetery had hitched a ride with us in hopes of finding a new cemetery where kindred spirits convene come sundown. And here with the unusual stones and statues he found a place to his liking. Perhaps they’re right. The sun went down early on a lot of folks when it was yet day. 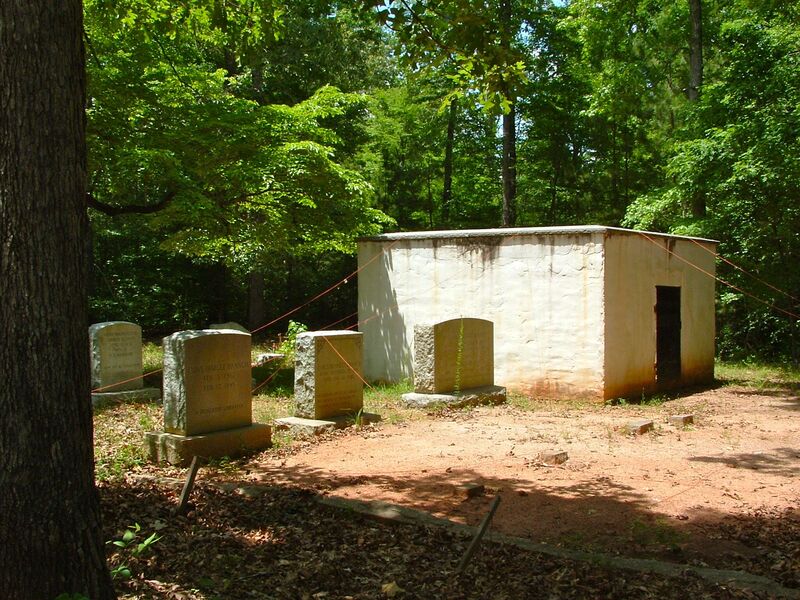 Dr. John de la Howe’s tomb never had a roof, per his request.